After being stuck inside all winter, many families find that they need more space in their homes to live, work, and play. Rather than calling the real estate agent to start looking for new homes, consider adding an addition to the home you already love. With mild temperatures and weather, the spring is the perfect time to think about building an addition. Spring construction typically has fewer weather delays; likewise, the nice weather outside allows you to get out of the house more during the construction process. In addition to the beautiful spring weather, below are some of the reasons why you should consider adding an addition on to your home. Whether you have a new baby on the way or an aging parent who will be moving in, adding an addition to your home can give everyone the space they need. Likewise, new construction can be personalized to specifically meet the needs of your family, creating a custom space that will be enjoyed for years to come. An addition can give homeowners an excellent return on investment. On average, for every 1000 square feet you add to your home, it’s value increases 3.3%. Likewise, according to the National Association of Homebuilders, each additional bedroom increases the value by 4% while half baths add as much as 10.5% and full bathrooms can add a whopping 20%. To stay in their current homes, most families need more space and more storage. Adding an addition can solve both of these problems. Adding another stall to a garage can provide space for sports equipment, additional vehicles, and even boats or RVs. Likewise, completing a project like finishing a basement or attic can add valuable square footage to your home. Adding an addition to your home allows you to stay in the neighborhood and home you already love. While an addition may seem like a costly expense, it may actually be less than the costs associated with buying a new home and moving. When building an addition, you have control over every detail of the room. This allows you to completely customize a space to fit your needs, whether it is a music studio, suite over the garage, or a major kitchen expansion. In addition, adding a room like a sunroom allows your family to bring the outdoors in and enjoy warmth and sunshine all year long, even in the cold months of winter. If you’re thinking about adding an addition to your home, the spring is the perfect time of year to do so. 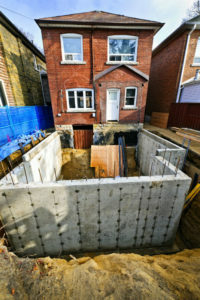 For more information on how an addition can improve your home, contact L & L Contractors today. Our expert staff is eager to work with you to create a design that meets your family’s needs while staying within your budget.